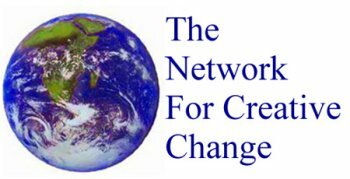 Welcome to the Network For Creative Change! In the summer of 1996, a group of Nova Scotians came together to bring Robert Theobald, economist and futurist, to Nova Scotia to participate in community -based discussions following his proposed Massey lecture series on "fundamental transformational change at the personal and community level". Subsequently this group went on to found the Network for Creative change (NCC) with the goal of facilitating "systemic change" through creativity, learning, design and development using networking concepts. Realizing that electronic networks constitute the new knowledge networks of the late 1990's and that these networks have the capacity to empower and inspire new ways of understanding and doing things in a more creative and systemic manner, the founding members chose to launch their new Network for Creative Change with a website and list serve. We engaged one of our founding members Dr. Janet M. Eaton, a well-known systemic change agent, researcher and educator to provide the content for this website with a view to creating greater awareness of "systemic change". By systemic change we mean change based on a systemic perspective which views the world as interconnected, the whole as greater than the parts, the intuitive as important as the rational, all knowledge as interrelated, everything seen in relationship not as parts and recognizing that certain general systems principles are common to all disciplines and spheres of human activity. Perusing this website you will be able to link to other websites that offer explanations of living systems, Gaia theory, Chaos theory, General Systems Theory and Cybernetics as well as sites providing some of the latest research on human consciousness, and the writings of systemic thinkers, consultants and authors. In addition, you will find links to websites related to practical applications of systemic, holistic and ecological theory and thinking e.g. in organizational change, education, environment and business and governance. Also offered for further systemic learning are links to a comprehensive collection of reference material related to systemic theory and its application as well as links to related list serves. To introduce the subject of systemic change Janet has provided i) excerpts from the literature that explain what we mean by "systemic" ii) chosen various quotes from systemic thinkers expressing their views on the problems of the world and solutions from a systemic perspective and iii) most excitingly has provided insights into systemic change through "metaphor" . She has reviewed the importance of "metaphor " for systemic learning and provided many examples. Through these metaphors you will find the older concepts or perceptions of our world materializing as giant clockwork mechanisms and machines, while the newer systemic view of the world emerges as Capra's "Web of life", Laszlo's whispering pond, or Russel's "global brain". You will also find Elisabet Sahtouris creative approach to understanding the complexities of "global economics" as seen through the metaphor of the human body. "What if", she says, "we stored up the blood in the heart, then dictated the price of blood and shipped it only to the organs which could afford it?" Simple metaphor can help us to see things with clarity and new insights. One of the most exciting aspects of the NCC website is its focus on citizenship for both local and global action and at the global level the emphasis on the Multilateral Agreement on investment (MAI) and its broader context of "global economics". Through the information highway the on-line world of concerned citizens and non-profit groups are expressing their views and concerns about a treaty which from our first viewing seemed an unnatural and unfair set of rules to impose without consultation with citizens and governments at all levels. It seems that the action made possible through the Internet, has born out our worst concern. In fact many are saying that the Internet, especially because of its attributed role in derailing the MAI for the time being, has become a new arena for "Global Democracy" through the world wide sharing of knowledge and experience, and the awareness and action made possible. Again we have to thank Janet Eaton , who has been active on the MAI-not international list serve, for gathering and synthesizing this information for us all. We share a common concern that many of the problems in the world today are the result of the scientific mechanistic reductionist way of thinking and viewing the world which has existed for several centuries and is just beginning to change. We believe that the solutions at this period in history must be "systemic" in nature and based on a "systemic" world view. Perhaps you agree. In any event we hope you will find this website challenging, full of new ideas and ways of doing things differently , and useful. We also hope that you will enjoy yourselves and come back many times to further explore. We acknowledge the support of Human Resource Development Canada in the development activities to make possible the launching of the Nova Scotia Network for Creative Change website and list serve. We are new at all of this and therefore look forward to your comments, suggestions and general feedback to help us continue to shape this website into a useful and practical learning resource for systemic change.